Malignant proliferating trichilemmal tumour (MPTT) is a rare cutaneous tumour predominantly affecting the scalp, eyelids, neck and face. A review of the literature reveals MPTT to be a neoplasm of the older age group. , We present a case of MPTT occurring in a young lady. A 26-year-old lady presented with a history of swelling behind her right ear of seven months' duration. There was no history of any discharge or constitutional symptoms. She gave a history of a similar swelling in the same region (right post-auricular) for which she underwent excision and split-skin grafting nine months ago. On histopathology, it was found to be a proliferating trichilemmal tumour. The lesion recurred within two months of excision and increased to the present size in seven months. There was a rapid increase in size in the last two months. The patient also gave a history of another swelling in the right parieto-occipital region which was excised two years ago and was diagnosed as a benign trichilemmal tumour. 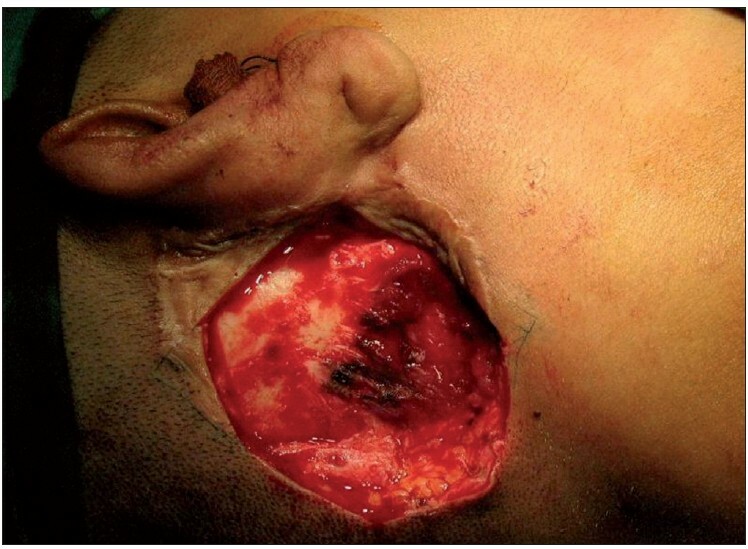 On examination, there was a 2.5 Χ 2 cm hemispherical swelling in the right post-auricular region, with an overlying scar of the previous split-skin grafting [Figure 1]. It was non-tender, firm in consistency and was not mobile. The skin was not pinchable. A differential diagnosis of recurrent trichilemmal tumour, keratoacanthoma and cylindroma was considered. A linear well-healed scar was also noted in the right parieto-occipital region [Figure 1]. There was no regional lymphadenopathy. To evaluate the underlying bone involvement and the exact extent of tumour, radiological workup was done with X-ray skull and computed tomography (CT) scan which showed no bone involvement [Figure 2]. Under general anaesthesia with endotracheal intubation, patient in the supine position with the head turned towards the left, a rhomboid-shaped incision was made around the tumour. Wide excision was done giving a 2 cm clearance all around. 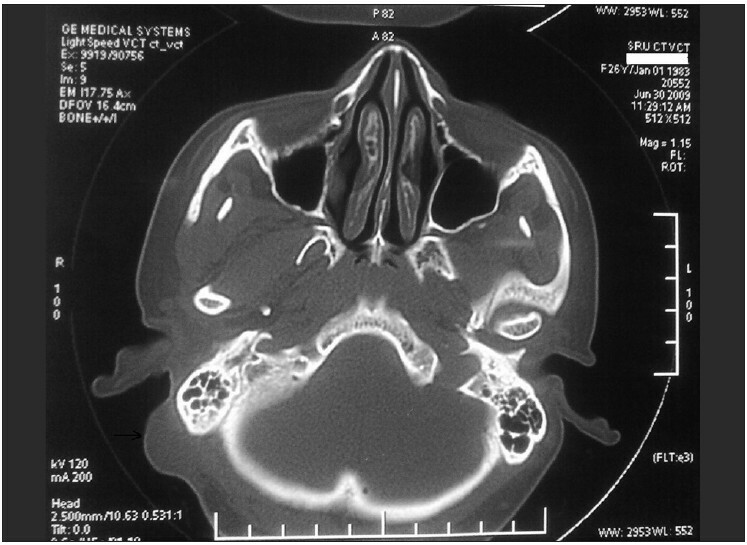 The underlying mastoid was shaved as a precautionary measure [Figure 3]. A transposition flap from the neck was used to cover the defect in the right post-auricular region. The postoperative course was uneventful and the patient is doing well on follow-up. Gross examination of the excised skin showed a centrally positioned nodule measuring 2.2 cm in diameter just beneath the skin. Grossly, the overlying skin, circumferential and deep resected margins were not involved by the lesion. Histopathological examination of haematoxylin and eosin (H and E)-stained sections from the skin showed a tumour located in the dermis. The tumour cells were arranged as islands, in lobular and diffuse pattern [Figure 4] and [[Figure 5]a]. Neoplastic cells were oval to polygonal with abundant cytoplasm and many showed individual cell keratinization [[Figure 5]b]. The predominant population of tumour cells showed clearing of cytoplasm with high nucleo-cytoplasmic ratio, nuclear hyperchromasia and moderate nuclear pleomorphism [[Figure 5]b and c]. 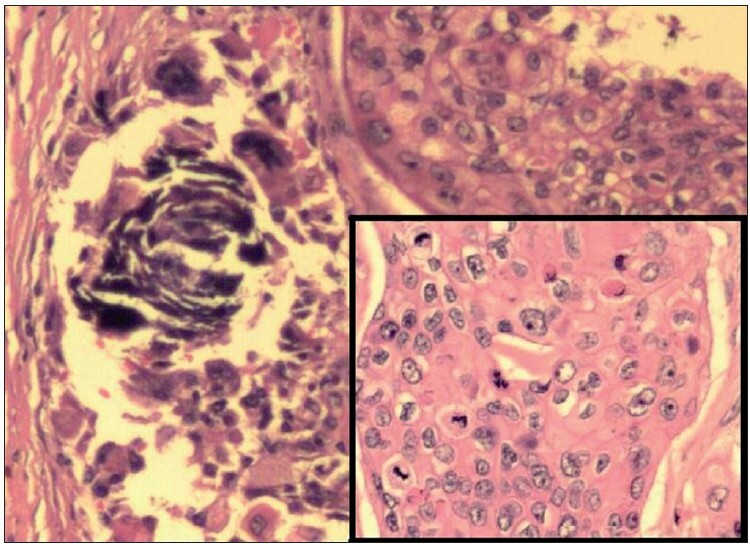 Tumour lobules showed abrupt keratinization [[Figure 5]d] and calcification [Figure 6]. Some of the tumour cells appeared bizarre. Numerous mitotic figures were also noted [[Figure 6] inset]. Occasional focus showed foreign body giant cell reaction. On microscopic examination, skin, soft tissue and bony margins were free of tumour. Final diagnosis on histopathological examination was malignant proliferating trichilemmal tumour. One year after the surgery, patient is doing well with no recurrence [Figure 7]. It may be difficult to distinguish MPTT from squamous cell carcinoma and trichilemmal carcinoma (TLC) which are known to occur at the same site. , Histological examination of a malignant tumour in the scalp showing evidence of keratin production suggests squamous cell carcinoma, a more common tumour at this site. Evidence of trichilemmal keratinization, lobular pattern and the lack of a precursor epidermal lesion such an actinic keratosis differentiates MPTT from squamous cell carcinoma. Since MPTT has a tendency to metastasize and recur more frequently than squamous cell carcinoma, an accurate diagnosis is essential. Treatment modalities differ for TLC and MPTT and a review of the literature reveals the former to be a malignant neoplasm with indolent behaviour, hardly ever resulting in recurrence or metastasis. Surgery is the treatment of choice for TLC with complete excision and periodical follow-up. Wide local excision with a 1-cm margin of normal tissue is the preferred treatment for MPTT. In addition to surgery, chemotherapy and radiotherapy have been used by some authors to prevent recurrence in MPTT. No adjuvant therapy was given to our patient post surgery. However, the patient has been kept under close follow-up and there has been no recurrence one year after the surgery. Malignant proliferating trichilemmal tumour can rarely occur in the young especially, in an individual with pre-existing proliferating trichilemmal tumour. Since it follows an aggressive course, it is essential to distinguish it from other similar-looking neoplasms for an appropriate therapy. 1. Trabelsi A, Stita W, Gharbi O, Kanani N, Sriha B, Korbi S. Malignant proliferating trichilemmal tumor of the scalp: A case report. Dermatol Online J 2008;14:11. 2. Garg PK, Dangi A, Khurana N, Hadke NS. 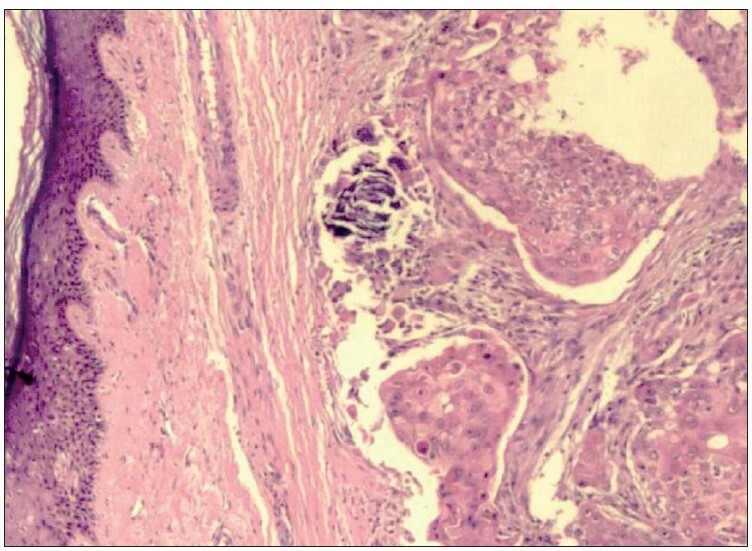 Malignant proliferating trichilemmal cyst: A case report with review of literature. Malays J Pathol 2009;31:71-6. 3. Alsaad KO, Obaidat NA, Ghazarian D. Skin adnexal neoplasms-part 1: An approach to tumours of the pilosebaceous unit. Clin Pathol 2007;60:129-44. 4. Saida T, Oohara K, Hori Y, Tsuchiya S. Development of a malignant proliferating trichilemmal cyst in a patient with multiple trichilemmal cysts. Dermatologica 1983;166:203-8. 5. Siddha M, Budrukkar A, Shet T, Deshpande M, Basu A, Patil N, et al. Malignant pilar tumor of the scalp: A case report and review of literature. J Can Res Ther 2007;3:240-3. 6. Ye J, Nappi O, Swanson PE, Patterson JW, Wick MR. Proliferating pilar tumors: A clinicopathologic study of 76 cases with a proposal for definition of benign and malignant variants. Am J Clin Pathol 2004;122:566-74. 7. Rutty GN, Richman PI, Laing JH. Malignant change in trichilemmal cysts: A study of cell proliferation and DNA content. Histopathology 1992;21:465-8. 8. Uchida N, Tsuzuki Y, Ando T, Mochida Y, Yoshikawa M, Sekihara M, et al. 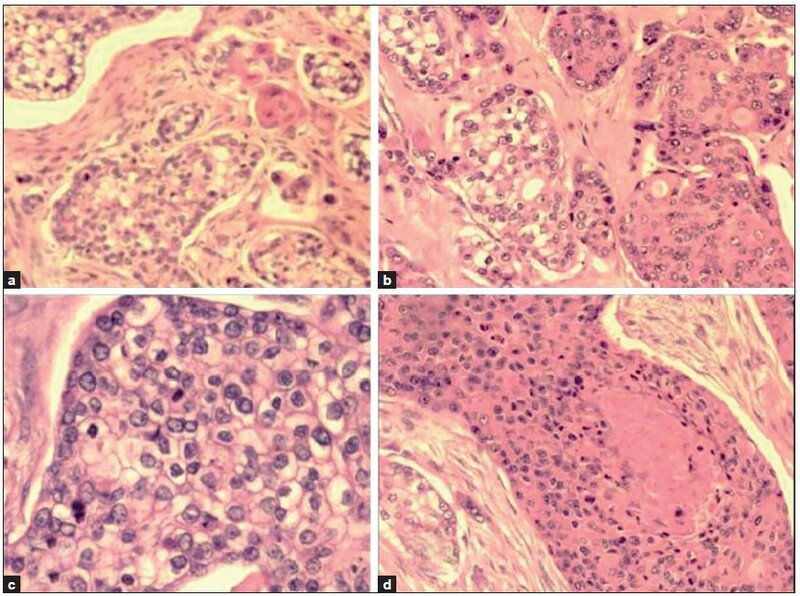 Malignant proliferating trichilemmal tumor in the skin over the breast: A case report. Breast Cancer 2000;7:79-82. 9. Yotsuyanagi T, Urushidate S, Yokoi K, Sawada Y. A malignant proliferating trichilemmal tumor simulating a squamous cell carcinoma. Eur J Plast Surg 1997;20:320-2. 10. Kim HJ, Kim TS, Lee KH, Kim YM, Suh CH. Proliferating trichilemmal tumors: CT and MR imaging findings in two cases, one with malignant transformation. AJNR Am J Neuroradiol 2001;22:180-3. 11. Swanson PE, Marrogi AJ, Williams DJ, Cherwitz DL, Wick MR. Trichilemmal carcinoma: Clinicopathologic study of 10 cases. J Cutan Pathol 1992;19:100-9. 12. Reis JP, Tellechea O, Cunha MF, Baptista AP. Trichilemmal carcinoma: Review of 8 cases. J Cutan Pathol 1993;20:44-9. 13. Headington JT. Tumors of the hair follicle: A review. Am J Pathol 1976;85:479-514. 14. Satyaprakash AK, Sheehan DJ, Sangüeza OP. Proliferating trichilemmal tumors: A review of the literature. Dermatol Surg 2007;33:1102-8. 15. Plumb SJ, Argenyi ZB, Stone MS, De Young BR. Metastatic adenocarcinoma. Am J Dermatopathol 2004;26:447-51. 16. Herrero J, Monteagudo C, Ruiz A, Llombart-Bosch A. Malignant proliferating trichilemmal tumors: An histopathologic and immunohistochemical study of three cases with DNA ploidy and Morphometric evaluation. Histopathology 1998;33:542-6.